The Associated Press- COLUMBIA, Mo. 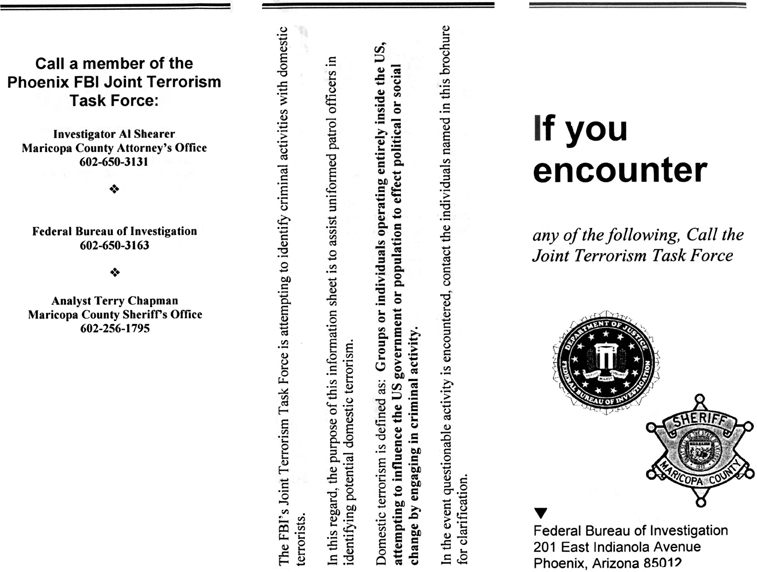 | A new document meant to help Missouri law enforcement agencies identify militia members or domestic terrorists has drawn criticism for some of the warning signs mentioned. 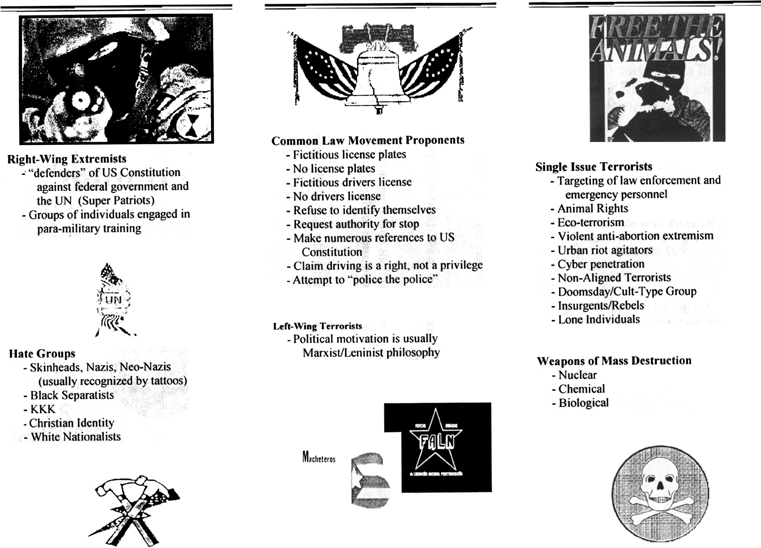 The Feb. 20 report called "The Modern Militia Movement" mentions such red flags as political bumper stickers for third-party candidates, such as U.S. Rep. Ron Paul, who ran for president last year; talk of conspiracy theories, such as the plan for a superhighway linking Canada to Mexico; and possession of subversive literature. "It seems like they want to stifle political thought," said Roger Webb, president of the University of Missouri campus Libertarians. "There are a lot of third parties out there, and none of them express any violence. In fact, if you join the Libertarian Party, one of the things you sign in your membership application is that you don't support violence as a means to any ends." But state law enforcement officials said the report is being misinterpreted. Lt. John Hotz of the Missouri State Highway Patrol said the report comes from publicly available, trend data on militias. It was compiled by the Missouri Information Analysis Center, a "fusion center" in Jefferson City that combines resources from the federal Department of Homeland Security and other agencies. The center, which opened in 2005, was set up to collect local intelligence to better combat terrorism and other criminal activity, he said. "All this is an educational thing," Hotz said of the report. "Troopers have been shot by members of groups, so it's our job to let law enforcement officers know what the trends are in the modern militia movement." But Tim Neal, a military veteran and delegate to last year's state GOP convention, was shocked by the report's contents. "I was going down the list and thinking, 'Check, that's me,'" he said. "I'm a Ron Paul supporter, check. I talk about the North American union, check. I've got the 'America: Freedom to Fascism' video loaned out to somebody right now. So that means I'm a domestic terrorist? Because I've got a video about the Federal Reserve?" Neal, who has a Ron Paul bumper sticker on his car, said the next time he is pulled over by a police officer, he won't know whether it's because he was speeding or because of his political views. A mason, Benjamin Franklin's links to occult secret societies have long been known. In the clip below, the History Channel talks about his involvement in the Hellfire Club, a secret society that conducted black masses and orgies. These bizarre, occult practices are still going on today in secret societies like the Bohemian club (Alex Jones infilitrated the Bohemian Grove and caught one of their rituals on tape -- click here to go see the video). In 1998, workmen restoring Franklin's London home dug up the remains of six children and four adults hidden below the home. The London Times reported on February 11, 1998: "Initial estimates are that the bones are about 200 years old and were buried at the time Franklin was living in the house, which was his home from 1757 to 1762, and from 1764 to 1775. Most of the bones show signs of having been dissected, sawn or cut. One skull has been drilled with several holes. Paul Knapman, the Westminster Coroner, said yesterday: "I cannot totally discount the possibility of a crime. There is still a possibility that I may have to hold an inquest." "HOMOSEXUAL PROSTITUTION INQUIRY ENSNARES VIPS WITH REAGAN, BUSH: 'CALL BOYS TOOK MIDNIGHT TOUR OF WHITE HOUSE" [Watch news videos ]. Prescott Bush was charged by the U.S. government under TRADING WITH THE ENEMIES ACT in 1942 for being a nazi financier. His assets were seized. Even as the Taliban attacks US, Canadian, and British forces, organization is left off terrorist list in 'political' decision. When the US State Department issued its annual Country Reports on Terrorism last Friday, it listed numerous state-sponsors of terrorism, like Iran, and groups it considers foreign terrorist organizations, like Hamas, Al Qaeda, and Hizbullah. Conspiciously absent from the lists, however, was the Taliban. In an article entitled "Terrorism's Dubious 'A' List," the non-partisan Council on Foreign Relations (CFR) reports that the religious extremist organization has never been listed as a terrorist group by the US, Britain, the EU, Canada, Australia, or any of the coalition partners..
ANN ARBOR, MI -The Thomas More Law Center, a national public interest law firm based in Ann Arbor, Michigan, announced today that it has filed a federal lawsuit against Homeland Security Secretary Janet Napolitano. The lawsuit claims that her Department's "Rightwing Extremism Policy," as reflected in the recently publicized Intelligence Assessment, "Rightwing Extremism: Current Economic and Political Climate Fueling Resurgence in Radicalization and Recruitment," violates the civil liberties of combat veterans as well as American citizens by targeting them for disfavored treatment on account of the political beliefs. FAIR USE NOTICE: The above may be copyrighted material, and the use of it on LibertyFight.com may not have been specifically authorized by the copyright owner. Such material is made available on a non-profit basis for educational and discussion purposes only. We believe this constitutes a 'fair use' of any such copyrighted material as provided for in 17 USC ï¿½ 107. For more information go to: http://www.law.cornell.edu/uscode/17/107.shtml. If you wish to use copyrighted material from this site for purposes of your own that go beyond 'fair use', you must obtain permission from the copyright owner.